Braided hairstyles are the bread and butter of our hair repertoire for a few reasons. A) They're perhaps the most versatile antidote when it comes to creating a momentous hair look and can play a starring or supporting role in the end result, B) they're the most brilliant way to camouflage an otherwise hopelessly bad hair day, and C) even the braided hairstyles that look complicated are usually pretty effortless to achieve. Yep, you read that right. In fact, creating optical illusions via tucks, wraps, and twists can easily mimic the essence of skill and intricacy, and adorning them with unexpected accents by way of bows, pearls, hoops, and crowns immediately adds extra spice and interest. Easy braids and twists get a lot of attention and love in the summer months (no effort, duh), but we'd like to play devil's advocate and say they're even more clutch come winter. Of course, easy braided hairstyles transition seamlessly regardless of season, but they're a dream at masking hat hair, static, frizz, or grease—all factors that come into play with an extra vengeance when it's bone-dry and cold. Since celebrities are constantly dishing up tons of braided hair inspiration—and to prove our point—we've sifted through all the options to bring you 18 braided styles that are beguiling and easy alike. Keep scrolling! 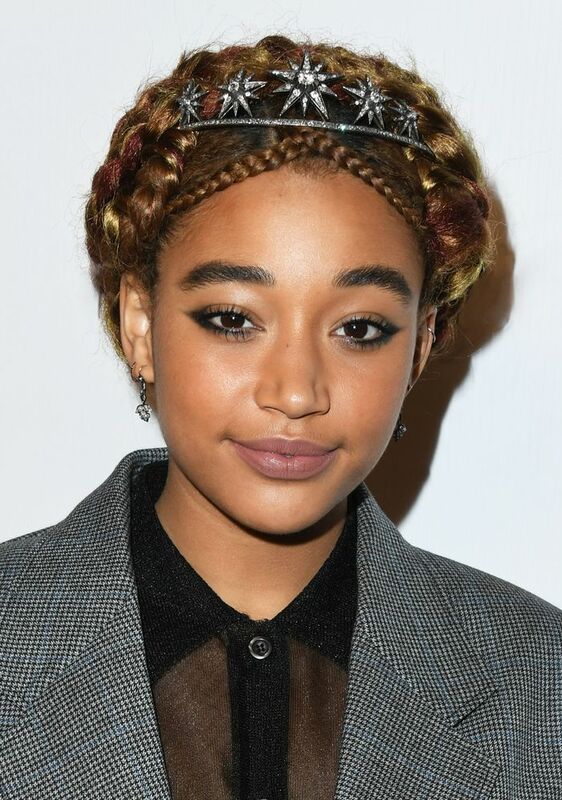 Thanks to her multitonal color and the enchanting add of a jeweled headband, Amandla Stenberg's basic milkmaid braid is taken up about 10 notches. Actress Gemma Chan is known for her romantic hair MO on the red carpet, and we're especially smitten with the way she's punctuated her low-hanging braid with a chic black bow on either end. If you thought braided hairstyles were solely reserved for those with a longer length, think again. Ruby Rose's teal-dipped faux-hawk situation is equal parts edgy and easy and proves even short-haired girls can play with effortless plaits. Sure, you could simply part your hair in the middle, braid both sides, and call it a day, or you could do the same and add a pretty sprinkling of pearls à la Rita Ora for a more elevated (yet still so easy) take. It's no secret that FKA Twigs just might have the coolest hair in all the land. We appreciate that she alternates her super-intricate hair moments with easier nods like this high ponytail wrapped in a medley of braids. When it comes to color, cut, and style, Drew Barrymore has experimented with the kitchen sink's worth of hair looks. If you're simply wanting to dip your toe into the braid pool—versus diving headfirst—we suggest adding a few hidden braids to a mermaid-esque beachy texture just like Drew. PSA: The previously frumpy French twist has had a major comeback in 2019, and Zoë Kravitz in a gilded bralette and tiny micro-braids is the most poignant proof we've yet to witness. Is it a ponytail, or is it a braid? The answer is both, and we couldn't be more eager to try Amanda Seyfried's easy hybrid come the weekend. Yara Shahidi has been a hot-and-heavy hair muse for a while now, but this polished, braided topknot complements her perfectly swooped edges to a very covetable T. Thus, it's one of our favorite hair moments from the actress yet. Janelle Monáe knows braids like the back of her hand. In fact, it's probably her most-worn style when it comes to performances and red carpet appearances alike. We're always murmuring with admiration, but we appreciate how she upgraded a more basic style like pigtail braids with pops of shine. And now we think we might actually prefer hoops in our hair over our ears this season. For those mornings when you literally have two minutes to get ready, take a page from Emily Ratajkowski's book and simply sweep your hair back and down into a super-loose, super-romantic braid. It's the easiest in the bunch by far. You need not dismiss braided buns as too galactic, too festival, or too childish. Margot Robbie proves a looser, lower take can look super chic. Plus, the style takes about two seconds. Like Monáe, Blake Lively has proved herself Queen of Braids on the red carpet over the years. That said, we still can't get this sleek, high-drama number out of our brains. Even though this look packs a punch in the drama department, it's actually so, so easy to achieve. Just pony, braid, and secure! We rarely see Priyanka Chopra wear her hair like this, but the deep-parted side braid offers the perfect change-up. This wouldn't be a braid roundup without a fishtail. There are plenty of ways to style it, of course, but we like the classic route actress Madelaine Petsch took with her low, off-the-shoulder style. Again proving you don't need super-long strands to pull off the prettiest of braided hairstyles, Lucy Hale shows off simple side braids embellished and pinned back with a dusting of floral accents. Technically, you don't need bangs to re-create Kate Bosworth's simple hairline twirl, but if you're in the infamously frustrating grow-out phase, we can't imagine a more flattering antidote. Next up, celebrity hairstylists say these are the best haircuts for every single face shape.